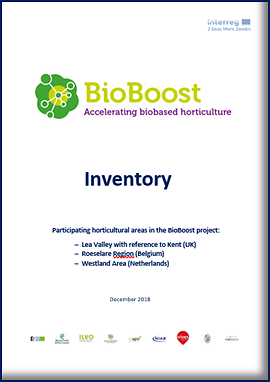 The BioBoost partnership has published a document that gives an insight into the three regions involved in their project: Flanders region around Roeselare (Belgium), Westland region (Netherlands) and Lea Valley (UK) with additional reference to Kent. The inventory considers the meaning of a circular and bio-economy for horticulture and describes these key regions, its main crops, by-products and waste streams from the horticultural industry. The aim of the inventory is to provide a joint basis for the partnership to shape effective actions and stimulate a more circular bio-economy for horticulture; initially in these regions, but ultimately across the country more widely. The inventory serves as input for strategies and approaches that will be developed later in the project. The inventory should also be interesting for anyone with an interest in the horticultural industry. Many farmers describe by-products as ‘waste’, this negatively impacts expectations and consumer acceptance. Renaming waste as ‘biomass residual streams and co-products’ helps to initiate a change in producer mind-set and consumer choice. The most significant co-products/residual streams were green waste and crop co-products. These are already the focus of new ideas and innovations making use of these resources. There are also opportunities to use by-products in the food chain, or to extract ingredients with high value from the ‘waste’; for example, as ingredients for cosmetics and natural crop protection products. A bio-based economy is about optimising the value of biomass. Prior to extraction of ingredients listed above, it is possible to use high-quality bio-refineries to produce new ingredients and/or make products for non-food applications. At bio-refineries, all parts of the plant (including non-edible parts) can be optimally utilised. The challenge is to organise new business models to extract ingredients like sugars, proteins, minerals and fibres and find new end-users. Currently, the majority of waste and co-product streams in each of the three regions covered are either ploughed back into the soil, or gathered and composted, for use in anaerobic digestion for biogas generation plants. The amounts of feedstock are considerable; in the Westland region in the Netherlands, growers, market gardeners, greenhouse companies and trading companies produce around 285,000 tonnes of crop residues every year. The amount varies greatly per crop. Glasshouse horticulture produces approximately 200,000 tonnes, of which the combined remnants of tomato and peppers crops amount to approximately 170,000 tonnes per year. The full report and annexes can be found on the BioBoost website in the ‘publications’ section.